I am an individual and looking for options to install rooftop solar home lighting system. I belong from a place of Jharkhand where due to forest area there is a lot of electricity problem. My requirement is to run a water motor of 1HP and recharge my InfraTubular battery set. Please suggest how you can be helpful to me. Future of Indian economy belongs to Solar energy. We lost many Sun power years. Instead of hydro,coal based plants & nuclear etc this Is very safe & eco friendly too. hi sneha shah, i leave in bhiwandi city near thane , i am shifting at new home and the benefit is that is on 9th floor so maximum sunlight on floor, so i was thinking to put solar home lighting system TL 300 so what is the procedure of installation and subsidy, and from where i will get this solar panels? As far as i know you can avail a bank loan in this reagrd and submit the papers for subsidy through your dealer. The dealer should be MNRE certified too. But I am not sure if it is allowed in urban areas. For this you need to get in touch with solar light supplier accrediated with MNRE. Thanks! Hi Sneha, What’s the subsidy rate for Solar Water Pumps in Gujarat and Maharashtra?. The Government provides a 40% subsidy on capital costs of a solar PV system (SPV), subject to a maximum amount. 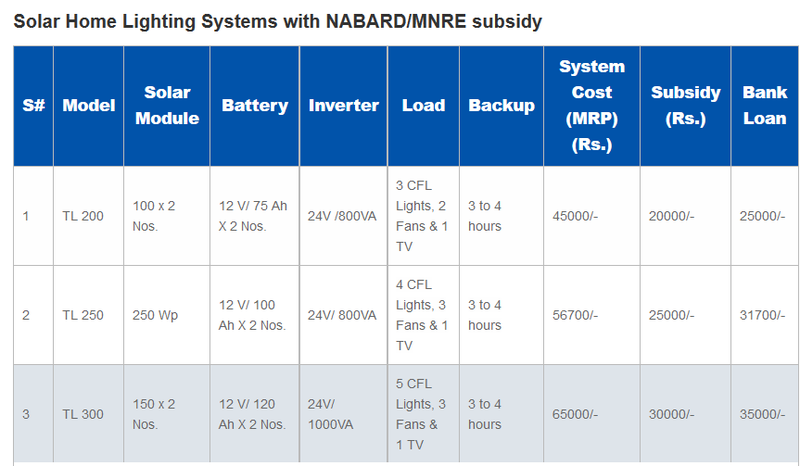 For availing subsidy on a solar system, it is important to select a supplier who is approved by the Ministry of New and Renewable Energy (MNRE). Only the specified PV systems are eligible for the subsidy. This subsidy scheme is available through NABARD. The subsidy scheme for solar water pumps differs from state to state. In Rajasthan a farmer typically pays just 14% of the cost of a solar water pump. 30% subsidy is provided under JNNSM scheme and upto 56% is provided by Rashtriya Krishi Vikas Yojana and MNRE. Want to know more about SOLAR LIGHTING SYSTEM…. As I m now in LED LIGHTING INDUSTRIES….. Please inform more about it….